“Hydroplate Theory: The Origin of Earth’s Radioactivity”. SUMMARY: As the flood began, stresses in the massive fluttering crust generated huge voltages via the piezoelectric effect.4 For weeks, powerful electrical surges within Earth’s crust—much like bolts of lightning—produced equally powerful magnetic forces that squeezed (according to Faraday’s Law) atomic nuclei together into highly unstable, superheavy elements. Those superheavy elements quickly fissioned and decayed into subatomic particles and various isotopes, some of which were radioactive. Each step in this process is demonstrable on a small scale. Calculations and other evidence show that these events happened on a global scale.5 To quickly understand what happened, see “Earthquakes and Electricity” on page 393 and Figures 204and 209–211. Evolutionists say Earth’s radioactive material evolved in stars and their exploded debris. Billions of years later, the Earth formed from that debris. Few of the theorized steps can be demonstrated experimentally. Observations on Earth and in space support the hydroplate explanation and refute the evolution explanation for Earth’s radioactivity. To contrast and evaluate two radically different explanations for the origin of Earth’s radioactivity, we will first explain some terms. With that background, new and surprising experimental evidence will become clear. Next, the two competing theories will be summarized: the hydroplate theory and the chemical evolution theory. Readers can then judge for themselves which theory better explains the evidence. First, we need to understand a few terms concerning the atom. An atom is small. Two trillion (2,000,000,000,000, or 2 × 1012 ) carbon atoms would fit inside the period at the end of this sentence. A nucleus is even smaller. If an atom were the size of a football field, its nucleus—which contains about 99.98% of an atom’s mass—would be the size of a tiny seed ! Electrons are smaller yet. An electron is to a speck of dust as a speck of dust is to the Earth! A carbon-12 atom, by definition, has exactly 12.000000 atomic mass units (AMU). If we could break a carbon-12 atom apart and “weigh” each of its six protons, six neutrons, and six electrons, the sum of their masses would be 12.098940 AMU—which is 0.098940 AMU heavier than the carbon-12 atom itself. To see why an atom weighs less than the sum of its parts, we must understand binding energy. A carbon-12 atom’s mass is exactly 12.000000 AMU—by definition. where c = 186,000 miles per second (the velocity of light). Figure 203: Binding Energy. When separate nucleons (protons and neutrons) are brought together to form a nucleus, a tiny percentage of their mass is instantly converted to a large amount of energy. That energy (usually measured in units of millions of electron volts, or MeV) is called binding energy, because an extremely strong force inside the nucleus tightly binds the nucleons together—snaps them powerfully together—producing a burst of heat. For example, a deuterium (hydrogen-2) nucleus contains a proton and a neutron. Its nucleus has a total binding energy of about 2.2 MeV, so the average binding energy per nucleon is about 1.1 MeV. If two deuterium nuclei merge to become helium, 2.2 MeV + 2.2 MeV of binding energy are replaced by helium-4’s average binding energy of 7.1 MeV per nucleon, or a total of 4 x 7.1 MeV. The gain in binding energy becomes emitted heat. This merging of light nuclei is called fusion. The Sun derives most of its heat by the fusion of deuterium into helium.8 The peak of the binding energy curve (above) is around 60 AMU (near iron), so fusion normally9 merges into nuclei lighter than 60 AMU. The fusion of elements heavier than 60 AMU absorb energy. Fission is the splitting of heavy nuclei. For example, when uranium fissions, the sum of the binding energies of the fragments is greater than the binding energy of the uranium nucleus, so energy is released. Fission (as well as fusion) can be sustained only if energy is released to drive more fission (or fusion). The closer the mass of a nucleus is to the mass of an iron or nickel nucleus (60 AMU), the more binding energy that nucleus has per nucleon. Let’s say that a very heavy nucleus, such as a uranium nucleus weighing 235.0 AMU, splits (fissions) into two nuclei weighing 100.0 AMU and 133.9 AMU and a neutron (1.0 AMU). The 0.1 AMU of lost mass is converted to energy, according to Einstein’s famous equation, E = m c2, where c is the speed of light (186,000 miles per second) and E is the energy released when a mass m is converted to energy. The energy is great, because c2 is huge. (For example, when the atomic bomb was dropped on Hiroshima, only about 700 milligrams of mass—about one-third the mass of a U.S. dime—was converted to energy.) Nuclear energy is usually released as kinetic energy. The high velocity fragments generate heat as they slow down during multiple collisions. Stated another way, a very heavy nucleus sometimes splits, a process called fission. (Fission may occur when a heavy nucleus is hit by a neutron, or even a high-energy photon (particle of light). When fission happens spontaneously—without being hit—it is a type of decay. When fission occurs, mass is lost and energy is released. Likewise, when light nuclei merge (a process called fusion), mass is lost and energy is released. In an atom bomb, uranium or plutonium nuclei split (fission). In a hydrogen bomb, hydrogen nuclei merge (fuse) to become helium. Fission inside nuclear reactors produces many free neutrons. Water is an excellent substance for absorbing the energy of fast neutrons and thereby producing heat, because water is cheap and contains so much hydrogen. (A hydrogen atom has about the same mass as a neutron, so hydrogen quickly absorbs a fast neutron’s kinetic energy.) The heat can then boil water to produce steam that spins a turbine and generates electricity. Isotopes. Chemical elements with the same number of protons but a different number of neutrons are called isotopes. Every chemical element has several isotopes, although most are seen only briefly in experiments. Carbon-12, carbon-13, and carbon-14 are different isotopes of carbon. All are carbon, because they have 6 protons, but respectively, they have 6, 7, and 8 neutrons—or 12, 13, and 14 nucleons. The number of protons determines the chemical element; the number of neutrons determines the isotope of the element. Radioisotopes. Radioactive isotopes are called radioisotopes. Only about 65 naturally occurring radioisotopes are known. However, high-energy processes (such as those occurring in atomic explosions, atomic accelerators, and nuclear reactors) have produced about 3,000 different radioisotopes, including a few previously unknown chemical elements. Decay Rates. Each radioisotope has a half-life—the time it would take for half of a large sample of that isotope to decay at today’s rate. Half-lives range from less than a billionth of a second to many millions of trillions of years.14 Most attempts to change decay rates have failed. For example, changing temperatures between -427°F and +4,500°F has produced no measurable change in decay rates. Nor have accelerations of up to 970,000 g, magnetic fields up to 45,000 gauss, or changing elevations or chemical concentrations. Decay rates for silicon-32 (32Si), chlorine-36 (36Cl), manganese-54 (54Mn), and radium-226 (226Ra) depend slightly on Earth’s distance from the Sun.19 They decay, respectively, by beta, alpha, and electron capture. Other radioisotopes seem to be similarly affected. This may be an electrical effect or a consequence of neutrinos20 flowing from the Sun. Radioactive material is placed in or on a Van de Graaff generator where an electric potential of 50,000 – 500,000 volts is applied for at least 30 minutes. This large negative voltage is thought to lower each nucleus’ energy barrier. Thus alpha, beta, and gamma particles rapidly escape radioactive nuclei. While these electrical devices may accelerate decay rates, a complete theoretical understanding of them does not yet exist, they are expensive, and they act only on small samples. However, the common belief that decay rates are constant in all conditions should now be discarded. Some people may think that a balloon’s age can be determined by dividing the balloon’s total leakage by its leakage rate today. Here, we will address more basic issues: What “pumped up” all radioisotopes in the first place, and when did it happen? Did the pumping process rapidly produce considerable initial leakage—billions of years’ worth, based on today’s slow leakage rates? Figure 204: Valley of Stability. Each of the more than 3,100 known isotopes is defined by two numbers: the number of protons (P) and the number of neutrons (N). Think of each isotope as occupying a point on a horizontal P–N coordinate system. There, each isotope’s stability can be represented by a thin, vertical bar: tall bars for isotopes that decay rapidly, shorter bars for isotopes with longer half-lives, and no vertical bars for stable isotopes.10 Almost 300 stable isotopes are represented far below the curved orange line, in what is called the valley of stability. It lies near the diagonal between the P axis and the N axis. Almost all isotopes represented by the high, flat “plateau” are hypothetical and have never been seen, but if they ever formed, they would decay instantly. Most of the thousand or so isotopes briefly observed in experiments lie just below the edge of the “cliff” looking down into the valley. Those on the steep slope have half-lives of seconds to billions of years. Stable isotopes are down on the valley floor. Notice how the valley curves toward the right.11 Light, stable nuclei have about the same number of protons as neutrons (such as carbon-12 with six protons and six neutrons); heavy nuclei that are stable have many more neutrons than protons. A key point to remember: if we could squeeze several light, stable nuclei together to make one heavy nucleus, it would lie high on the proton-heavy side of the valley, be radioactive, and would soon decay. If all Earth’s nuclei were initially nonradioactive, they would all have been at the bottom of the curved valley of stability. If, for weeks, chaotic discharges of electrons, driven by billions of volts of electricity, pulsed through the Earth’s crust, radioactive isotopes and their decay and fission products would quickly form. (How this happened will be explained later.) We can think of these new isotopes as being scattered high on the sides of the valley of stability. It would be as if a powerful explosion, or some sudden release of energy, blasted rocks up onto the steep sides of a long valley. Most rocks would quickly roll back down and dislodge somewhat unstable rocks that were only part way up the slope. Today, rocks rarely roll down the sides of the valley. Wouldn’t it be foolish to assume that the rubble at the bottom of this valley must have been accumulating for billions of years, merely because it would take billions of years for all that rubble to collect at the very slow rate rocks roll down today? Later in this chapter, you will see the well-established physical processes that —in less than one hour—greatly accelerated radioactive decay during the flood. Neutron Activation Analysis. This routine, nondestructive technique can be used to identify chemical elements in an unknown material. Neutrons, usually from a nuclear reactor, bombard the material. 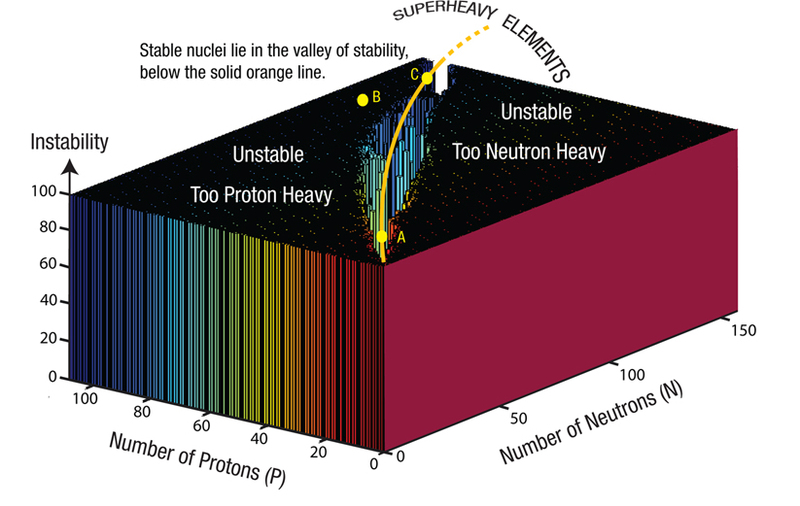 Some nuclei that absorb neutrons become radioactive—are driven up the neutron-heavy side of the valley of stability. [See Figure 204 on page 390.] The decay characteristics of those “pumped up” nuclei then help identify the atoms present. Neutron Stars. When a very massive star begins to run out of hydrogen and other nuclear fuels, it can collapse so suddenly that almost all its electrons are driven into nuclei. This produces a “sea of neutrons” and releases the immense energy of a supernova. What remains near the center of the gigantic explosion is a dense star, about 10 miles in diameter, composed of neutrons—a neutron star. The Strong Force. Like charges repel each other, so what keeps a nucleus containing many positively charged protons from flying apart? A poorly understood force inside the nucleus acts over a very short distance to pull protons (and, it turns out, neutrons, as well) together. Nuclear physicists call this the strong force. Binding energy, described on page 388, is the result of work done by the strong force. While the strong force holds nuclei together and overcomes the repelling Coulomb force, four particular nuclei are barely held together: lithium-6 (6Li), beryllium-9 (9Be), boron-10 (10B), and boron-11 (11B). Slight impacts will cause their decay.23 The importance of these fragile isotopes will soon become clear. Free Neutrons. Neutrons in a nucleus rarely decay, but free neutrons (those outside a nucleus) decay with a half-life of about 14.7 minutes! Why should a neutron surrounded by protons and electrons often have a half-life of millions of years, but, when isolated, have a half-life of minutes? 24 This is similar to what Fritz Bosch discovered: When an intense electric field strips electrons surrounding certain heavy nuclei, those nuclei become so unstable that their decay rate increases, sometimes a billionfold. Since February 2000, thousands of sophisticated experiments at the Proton-21 Electrodynamics Research Laboratory (Kiev, Ukraine) have demonstrated nuclear combustion31 by producing traces of all known chemical elements and their stable isotopes.32 In those experiments, a brief (10-8 second), 50,000 volt, electron flow, at relativistic speeds, self-focuses (Z-pinches) inside a hemispherical electrode target, typically 0.5 mm in diameter. The relative abundance of chemical elements produced generally corresponds to what is found in the Earth’s crust. Each experiment used one of 22 separate electrode materials, including copper, silver, platinum, bismuth, and lead, each at least 99.90% pure. In a typical experiment, the energy of an electron pulse is less than 300 joules (roughly 0.3 BTU or 0.1 watt-hour), but it is focused—Z-pinched—onto a point inside the electrode. That point, because of the concentrated electrical heating, instantly becomes the center of a tiny sphere of dense plasma. With a burst of more than 1018 electrons flowing through the center of this plasma sphere, the surrounding nuclei (positive ions) implode onto that center. Compression from this implosion easily overcomes the normal Coulomb repulsion between the positively charged nuclei. The resulting fusion produces superheavy chemical elements, some twice as heavy as uranium and some that last for a few months.34 All eventually fission, producing a wide variety of new chemical elements and isotopes. The Proton-21 Laboratory, which has received patents in Europe, the United States, and Japan, collaborates with other laboratories that wish to verify results and duplicate experiments. 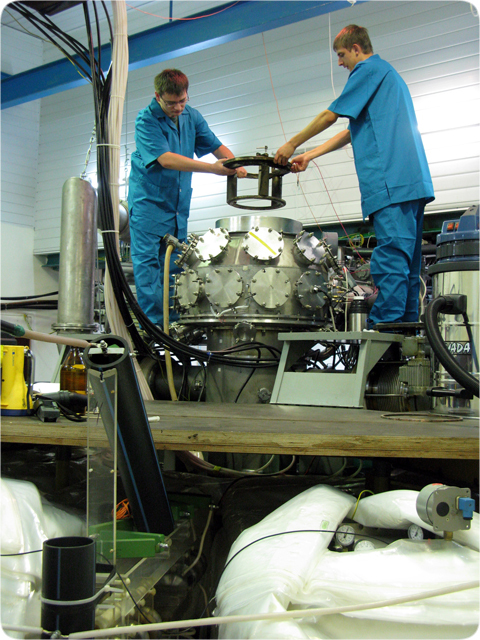 Figure 205: Preparing for a Demonstration of Nuclear Combustion at the Proton-21 Laboratory. Figure 206: Ruptured Electrode. This disk (0.02 of an inch in diameter) is a slice of one of the thousands of electrodes that ruptured when a self-focused, relativistic electron beam pinched into a 630,000,000°F “hot dot” that was only 4 billionths of an inch in diameter. 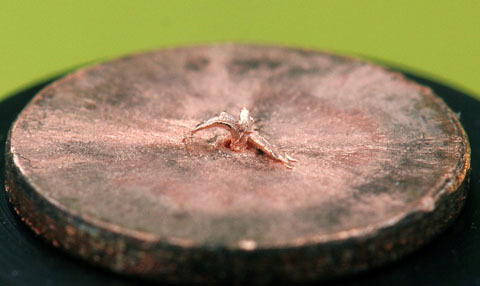 The focused heat was enough to melt a piece of rock a few millimeters in diameter. [See “Chondrules” on page 418.] Decay fragments and new chemical elements were splattered onto an accumulating screen for later analysis by a mass spectrometer. Argon-40. About 1% of Earth’s atmosphere (not counting water vapor) is argon, of which 99.6% is argon-40 and only 0.3% is argon-36. Both are stable. Today, argon-40 is produced almost entirely by electron capture in potassium-40. In 1966, Melvin Cook pointed out the great discrepancy in the large amount of argon-40 in our atmosphere, the relatively small amount of potassium-40 in the Earth’s crust, and its slow rate of decay (half-life: 1.3-billion years). Since Cook published that statement, estimates of the amount of 40K in the Earth have increased. Nevertheless, a glaring contradiction remains. Despite geophysicists’ efforts to juggle the numbers, the small amount of 40K in the Earth is not enough to have produced all the 40Ar, the fourth most abundant gas in the atmosphere (after nitrogen, oxygen, and water vapor). If 40Ar was produced by a process other than the slow decay of 40K, as the evidence indicates, then the potassium-argon and argon-argon dating techniques, the most frequently used radiometric dating techniques,27 become useless, if not deceptive. Likewise, Saturn’s icy moon Enceladus has little 40K but is jetting too much 40Ar into space from its south pole. Enceladus would need a thousand times its current rock content consisting of the most favorable types of meteorites to explain all the argon-40.28 Even with that much 40K, how would the argon rapidly escape from the rock and be concentrated? In the previous chapter, evidence was given showing that Enceladus and other irregular moons in the solar system are captured asteroids, whose material was expelled from Earth by the fountains of the great deep. Could all that 40Ar have been produced in the subterranean chamber and expelled as part of the debris? Enceladus also contains too much deuterium—about the same amount as in almost all comets and more than ten times the concentration found in the rest of the solar system.29 This was explained in the comet chapter as one of seventeen major reasons for concluding that the material in comets was launched from Earth by the fountains of the great deep. One final point: Micrometeorites and solar wind add at least seven times more 36Ar than 40Ar to Earth’s atmosphere. Therefore, those sources provided little of the Earth’s 40Ar,30 because, as stated above, our atmosphere has about 300 times more 40Ar than 36Ar. Helium Retention in Zircons. Uranium and thorium usually decay by emitting alpha particles. Each alpha particle is a helium nucleus that quickly attracts two electrons and becomes a helium atom (4He). The helium gas produced in zircons by uranium and thorium decay should diffuse out relatively quickly, because helium does not combine chemically with other atoms, and it is extremely small—the second smallest of all elements by mass, and the smallest by volume! 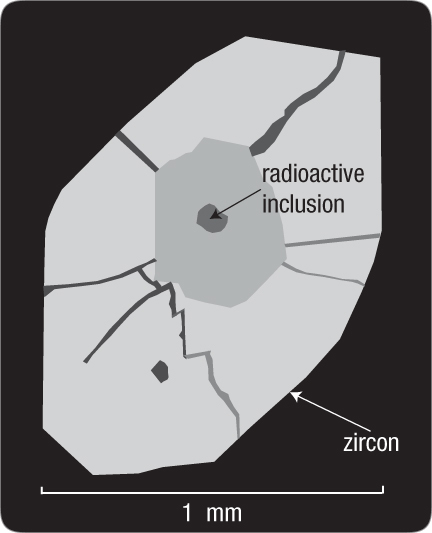 Some zircons would be 1.5-billion years old if the lead in them accumulated at today’s rate. But based on the rapid diffusion of helium out of zircons, the lead would have been produced in the last 4,000–8,000 years40—a clear contradiction, suggesting that at least one time in the past, rates were faster. Why are many large earthquakes accompanied by so much electrical activity? Are frightened people hallucinating? Do electrical phenomena cause earthquakes, or do earthquakes cause electrical activity? Maybe something else produces both electrical activity and earthquakes. Does all this relate to the origin of Earth’s radioactivity? Where Is Earth’s Radioactivity? Three types of measurements each show that Earth’s radioactivity is concentrated in the relatively thin continental (granite) crust. In 1906, some scientists recognized that just the heat from the radioactivity in the granite crust should explain all the heat now coming out of the Earth. If radioactivity were occurring below the crust, even more heat should be exiting. Because it is not, radioactivity should be concentrated in the top “few tens of kilometers” of the Earth—and have begun recently. Later, holes drilled into the ocean floor showed slightly more heat coming up through the ocean floors than through the continents. But basaltic rocks under the ocean floor contain little radioactivity.46 Apparently, radioactive decay is not the primary source of Earth’s geothermal heat. However, the rate at which temperatures increased with depth was so great that if the trend continued, the rock at the top of the mantle would be partially melted. Seismic studies have shown that this is not the case.48 Therefore, temperatures do not continue increasing down to the mantle, so the source of the heating is concentrated in the Earth’s crust. A third measurement technique, used in regions of the United States and Australia, shows a strange, but well-verified, correlation: the amount of heat flowing out of the Earth at specific locations correlates with the radioactivity in surface rocks at those locations. Wherever radioactivity is high, the heat flow will usually be high; wherever radioactivity is low, the heat flow will usually be low. However, the radioactivity at those hotter locations is far too small to account for that heat.49 What does this correlation mean? First, consider what it does not necessarily mean. When two sets of measurements correlate (or correspond), people often mistakenly conclude that one of the things measured (such as radioactivity in surface rocks at one location) caused the other thing being measured (surface heat flow at that location). Even experienced researchers sometimes make this mistake. Students of statistics are repeatedly warned of this common mistake in logic, and hundreds of humorous50 and tragic examples are given; nevertheless, the problem abounds in all research fields. This correlation could be explained if most of the heat flowing up through the Earth’s surface was generated, not by the radioactivity itself, but by the events that produced that radioactivity. If more heat is coming out of the ground at one place, then more radioactivity was also produced there. Therefore, radioactivity in surface rocks would correlate with surface heat flow. The Earth did not evolve. Had the Earth evolved from a swirling dust cloud (“star stuff”), radioactivity would be spread throughout the Earth. Supernovas did not produce Earth’s radioactivity. Had supernovas spewed out radioisotopes in our part of the galaxy, radioactivity would be spread evenly throughout the Earth, not concentrated in continental granite. The Earth was never molten. Had the Earth ever been molten, the denser elements and minerals (such as uranium and zircons) would have sunk toward the center of the Earth. Instead, they are found at the Earth’s surface. The Oklo Natural “Reactor.” Building a nuclear reactor requires the careful design of many interrelated components. Reactors generate heat by the controlled fission of certain isotopes, such as uranium-235 (235U). For some unknown reason, 0.72% of almost every uranium ore deposit in the world is 235U. (About 99.27% is the more stable 238U, and 0.01% is 234U.) For a 235U reactor to operate, the 235U must usually be concentrated to at least 3–5%. This enrichment is both expensive and technically difficult. Controlling the reactor is a second requirement. When a neutron splits a 235U nucleus, heat and typically two or three other neutrons are released. If the 235U is sufficiently concentrated and, on average, exactly one of those two or three neutrons fissions another 235U nucleus, the reaction continues and is said to be critical—or self-sustaining. If this delicate situation can be maintained, considerable heat (from binding energy) is steadily released, usually for years. In 1972, French engineers were processing uranium ore from an open-pit mine near the Oklo River in the Gabon Republic on Africa’s west equatorial coast. There, they discovered depleted (partially consumed) 235U in isolated zones.51 (In one zone, only 0.29% of the uranium was 235U, instead of the expected 0.72%.) Many fission products from 235U were mixed with the depleted 235U but found nowhere else. Nuclear engineers, aware of just how difficult it is to design and build a nuclear reactor, are amazed by what they believe was a naturally occurring reactor. But notice, we do not know that a self-sustaining, critical reactor operated at Oklo. All we know is that considerable 235U has fissioned. How could this have happened? Suppose, as is true for every other known uranium mine, Oklo’s uranium layer was never critical. That is, for every 100 neutrons produced by 235U fission, 99 or fewer other neutrons were produced in the next fission cycle, an instant later. The nuclear reaction would quickly die down; i.e., it would not be self-sustaining. However, suppose (as will soon be explained) many free neutrons frequently appeared somewhere in the uranium ore layer. Although the nuclear reaction would not be self-sustaining, the process would multiply the number of neutrons available to fission 235U.52 This would better match what is found at Oklo for four reasons. Second, one zone lies 30 kilometers from the other zones. Whatever strange events at Oklo depleted 235U in 16 largely separated zones was probably common to that region of Africa and not to some specific topography. Uranium deposits are found in many diverse regions worldwide, and yet, only in the Oklo region has this mystery been observed. Harms also explained why rapid spikes in temperature and nuclear power would produce a wide range in the ratios of 235U to 238U over very short distances. The question which will soon be answered is, what could have caused those spikes? For example, 238U, after a series of eight alpha decays (and six much less-damaging beta decays), will become lead-206 (206Pb). Therefore, eight concentric spheres, each with a slightly different color and radius, will surround what was a point concentration of a billion 238U atoms. Under a microscope, those radiohalos look like the rings of a tiny onion. [See Figure 207.] A thin slice through the center of this “onion” resembles a bull’s-eye target at an archery range. Each ring’s relative size identifies the radio isotope that produced it. Figure 207: Radiohalos from the 238U Decay Series. Suppose many 238U atoms were concentrated at the point of radioactivity shown here. Each 238U atom eventually ejects one alpha particle in a random direction, but at the specific velocity corresponding to 4.19 million electron volts (MeV) of energy—the binding energy released when 238U decays. That energy determines the distance traveled, so each alpha particle from 238U ends up at the gray spherical shell shown above. (Alpha particles from daughter isotopes will travel to different shells.) Each sharply defined halo requires the ejection of about a billion alpha particles from the common center of all halos, because each alpha particle leaves such a thin path of destruction. A 238U atom becomes 234U after the alpha decay and two less-damaging beta decays. Later, that 234U atom expels an alpha particle with 4.77 MeV of kinetic energy. As a billion 234U atoms decay, a sharp 234U halo forms. Eventually, a billion lead-206 (206Pb) atoms will occupy the halo center, and each halo’s radius will identify which of the eight radioisotopes produced it. While we might expect all eight halos to be nested (have a common center) as shown above, G. H. Henderson made a surprising discovery64 in 1939: halos formed by the decay of three polonium isotopes (218Po, 214Po, and 210Po) were often isolated, not nested. Since then, the mystery has deepened, and possible explanations have generated heated controversy. Thorium-232 (232Th) and 235U also occur naturally in rocks, and each begins a different decay series that produces different polonium isotopes. However, only the 238U series produces isolated polonium halos. Why are isolated polonium halos in the 238U decay series but not in other decay series? If the Earth is 4.5-billion years old and 235U was produced and scattered by some supernova billions of years earlier, 235U’s half-life of 700-million years is relatively short. Why then is 235U still around, how did it get here, what concentrated it, and where is all the lead that the 235U decay series should have produced? Isolated Polonium Halos. We can think of the eight alpha decays from 238U to 206Pb as producing the nine rungs on a generational ladder. Each alpha decay leads to the radioisotope on the ladder’s next lower rung. The last three alpha decays60 are of the chemical element polonium (Po): 218Po, 214Po, and 210Po. Their half-lives are extremely short: 3.1 minutes, 0.000164 second, and 138 days, respectively. Surprisingly, polonium radiohalos are often found without their parents—or any other prior generation! How could that be? Polonium is always a decay product. It must have had parents! Notice that 222Rn is on the rung immediately above the three polonium isotopes, but the 222Rn halo is missing. Because 222Rn decays with a half-life of only 3.8 days, its halo should be found with the polonium halos. Or should it? Dr. Robert V. Gentry, the world’s leading researcher on radiohalos, has proposed the following explanation for this mystery.61 He correctly notes that halos cannot form in a liquid, so they could not have formed while the rock was solidifying from a molten state. Furthermore, any polonium in the molten rock would have decayed long before the liquid could cool enough to solidify. Therefore, we can all see that those rocks did not cool and solidify over eons, as commonly taught! However, Gentry believes, incorrectly, that on Day 1 of the creation, a billion or so polonium atoms were concentrated at each of many points in rock; then, within days, the polonium decayed and formed isolated (parentless) halos. Gentry’s explanation has five problems. First, it doesn’t explain why a billion or so polonium atoms would be concentrated at each of trillions of points that would later become the centers of parentless polonium halos. Second, to form a distinct 218Po halo, those 218Po atoms, must undergo heat-releasing alpha decays, half of which would occur within 3.1 minutes. 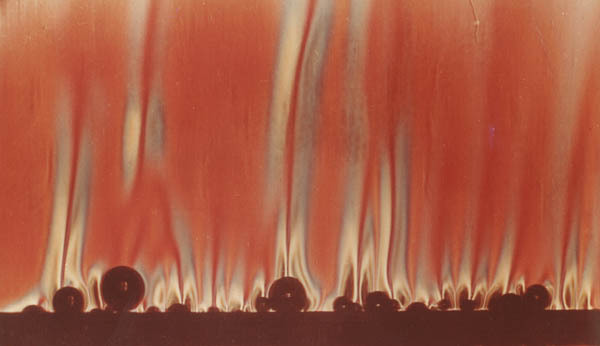 The great heat generated in such a tiny volume in just 3.1 minutes would have easily melted and erased that entire halo.62 Not only did melting not occur, had the temperature of the halo ever exceeded 300°F (150°C) the alpha tracks would have been erased (annealed).63 Obviously, an efficient heat removal mechanism, which will soon be explained, must have acted. Third, polonium has 33 known radioisotopes, but only three (218Po, 214Po, and 210Po) account for almost all the isolated polonium halos. Those three are produced only by the 238U decay series, and 238U deposits are often found near isolated polonium halos. Why would only those three isotopes be created instantly on Day 1? This seems unlikely. Instead, something produced by only the 238U decay series accounts for the isolated polonium halos. As you will soon see, that “something” turns out to be 222Rn. This implies that polonium atoms or their 222Rn parent flowed along what is now the central sheet and lodged in the channel wall as that mineral sheet grew. In other words, the polonium was not created on Day 1 inside solid rock. Fifth, isolated polonium halos are often found near uranium mines, where magma containing uranium was injected up through fossil bearing strata. Therefore the intrusions and polonium halos obviously came after the flood, which itself was long after creation. The magma slowly cooled and solidified, while the uranium began releasing 222Rn that was quickly dissolved and transported upward in flowing water. The polonium daughters of 222Rn, produced the parentless polonium halos. Dr. Lorence G. Collins has a different explanation for the polonium mystery. He first made several perceptive observations. The most important was that strange wormlike patterns were in “all of the granites in which Gentry found polonium halos.”70 Those microscopic patterns, each about 1 millimeter long, resembled almost parallel “underground ant tunnels” and were typically filled with two minerals common in granite: quartz and plagioclase [PLA-jee-uh-clase] feldspars, specifically sodium feldspars.71 The granite had not melted, nor had magma been present. The rock that contains these wormlike patterns is called myrmekite [MUR-muh-kite]. Myrmekites have intrigued geologists and mineralogists since 1875. Collins admits that he does not know why myrmekite is associated with isolated polonium halos in granites.72 You soon will. Collins notes that those halos all seem to be near uranium deposits and tend to be in two minerals (biotite and fluorite) in granitic pegmatites [PEG-muh-tites] and in biotite in granite when myrmekites are present.73 (Pegmatites will soon be described. Biotite, fluorite, and pegmatites form out of hot water solutions in cracks in rocks.) Collins also knows that radon (Rn) inside the Earth’s crust is a gas; under such high pressures, it readily dissolves in hot water. Because radon is inert, it can move freely through solid cracks without combining chemically with minerals lining the walls of those cracks. Collins correctly concludes that “voluminous” amounts of hot, 222Rn-rich water must have surged up through sheared and fractured rocks.74 When 222Rn decayed, 218Po formed. Collins insights end there, but they raise six questions. b. Why was the water 222Rn rich? 222Rn has a half-life of only 3.8 days! c.	Because halos are found in different geologic periods, did all this remarkable activity occur repeatedly, but at intervals of millions of years? If so, how? d.	What concentrated a billion or so 218Po atoms at each microscopic speck that became the center of an isolated polonium halo? Why wasn’t the 218Po dispersed? e.	Today’s extremely slow decay of 238U (with a half-life of 4.5-billion years) means that its daughters, granddaughters, etc. today form slowly. Were these microscopic specks the favored resting places for 218Po for billions of years, or did the decay rate of 238U somehow spike just before all that hot water flowed? Remember, 218Po decays today with a half-life of only 3.1 minutes. f.	Why are isolated polonium halos associated with parallel and aligned myrmekite that resembles tiny ant tunnels? Answers, based on the hydroplate theory, will soon be given. Figure 208: Radial Fractures. Alpha decays within this inclusion caused it to expand significantly, radially fracturing the surrounding zircon that was ten times the diameter of a human hair. These fractures were not along grain boundaries or other surfaces of weakness, as one would expect. Mineralogist Paul Ramdohr concluded that the expansion was explosive. To see why it was explosive, see "When, Where, How, and Why Did Radioactive Decay Rates Accelerate?" on page 400. The Hydroplate Theory. In the centuries before the flood, supercritical water (SCW) in the subterranean chamber steadily dissolved the more soluble minerals in the rock directly above and below the chamber. [Pages 124–125 explain SCW and its extreme dissolving ability.] Thin spongelike channels, filled with high-pressure SCW, steadily grew up into the increasingly porous chamber roof and down into the chamber floor. Figure 210: Fluttering Crust. Many of us have seen films showing Earth’s undulating crust during earthquakes. Imagine how magnified those waves would become if the crust, instead of resting on solid rock, were resting on a thick layer of unusually compressible water—SCW. Then, imagine how high those waves in the Earth’s crust would become if the “ocean” of water below the crust were flowing horizontally with great force and momentum. The crust’s vast area—the surface of the Earth (200,000,000 square miles)—gave the relatively thin crust great flexibility during the first few weeks of the flood. As the subterranean waters escaped, the crust flapped, like a large flag held horizontally in a strong wind. Flutter began as the fountains of the great deep erupted. [See “Water Hammers and Flutter Produced Gigantic Waves” on page 199.] Each time the crust arched downward into the escaping subterranean water, the powerful horizontal flow slammed into the dipping portion of the crust, creating a water hammer that then lifted that part of the crust. Waves rippled through the entire crust at the natural frequencies of the crust, multiplying and reinforcing waves and increasing their amplitudes. Grab a phone book with both hands and arch it upward. The top cover is in tension, and the bottom cover is in compression. Similarly, rock in the fluttering crust, shown above, would alternate between tension (T) and compression (C). As explained in Figure 209, huge cyclic voltages would build up and suddenly discharge within the granite crust, because granite contains so much quartz, a piezoelectric mineral. Once granite’s breakdown voltage was reached, electrical current—similar to bolts of lightning—would discharge vertically within the crust. Pillars (not shown) at the base of the crust would become giant electrodes. With each cycle of the fluttering crust, current surged through the lower crust, which was honeycombed with tiny pockets of salty (electrically conducting) subterranean water. Electrons flowing through solids, liquids, or gases are decelerated and deflected by electrical charges in the atoms encountered. These decelerations, if energetic enough, release bremsstrahlung (BREM-stra-lung) radiation which vibrates other nuclei and releases some of their neutrons. 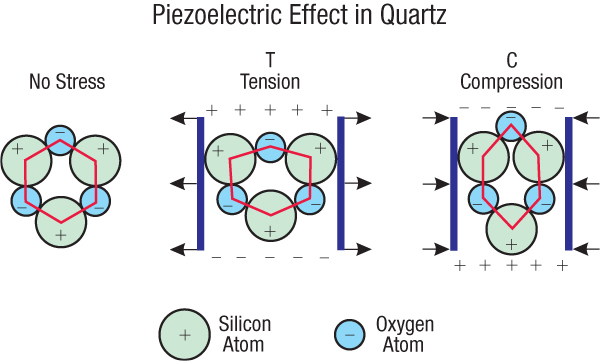 Figure 211: Piezoelectric Demonstration. When I rotate the horizontal bar of this device, a tiny piezoelectric crystal (quartz) is compressed in the vertical column just below the bar’s pivot point. The red cables apply the generated voltage across the two vertical posts mounted on the black, nonconducting platform. Once the increasing voltage reaches about 4,000 volts, a spark (a plasma) jumps the gap shown in the circular inset. When the horizontal bar is rotated in the opposite direction, the stress on the quartz crystal is reversed, so a spark jumps in the opposite direction. In this device, a tiny quartz crystal and a trivial amount of compression produce 4,000 volts and a small spark. Now consider trillions of times greater compression acting on a myriad of quartz crystals filling 27% of a 60-mile-thick crustal layer. (An “ocean” of subterranean water escaping from below that crust created water hammers, causing the crust to flutter and produce enormous compressive stresses in the crust.) The resulting gigavoltages would produce frightening electrical discharges, not through air, but through rock—and not across a little gap, but throughout the entire crustal layer. When, Where, How, and Why Did Radioactive Decay Rates Accelerate? Creationists, who believe the Earth is young, must explain why we see so many radioactive decay products if the Earth is not billions of years old. A few creationists, without carefully considering how Earth’s radioactivity began, say that radioactive decay rates must have miraculously accelerated at some unknown time in the past to produce all those decay products. But that would have generated enough heat to boil all the oceans away, so they say that another miracle must have removed all that heat. While I agree that the Earth is young, miracles should not be imagined to solve scientific problems. That would violate the most basic rule of science. For details, see Figure 254 on page 577 and Endnote 11 on page 581. Based on the considerable observable evidence already presented, here is a synopsis of what happened. At the beginning of the flood, piezoelectric surges Z-pinched (fused) various stable nuclei along the surge paths into unstable proton-heavy and superheavy nuclei, some of which rapidly fissioned and decayed. Months later, the compression event (which, as explained on page 499, lasted less than 1 hour) suddenly generated even more powerful piezoelectric surges which caused accelerated radioactive decay. Why did accelerated decay happen? As an example of one mode (the Giant Dipole Vibration Mode), known since the late 1940s,100 consider a high-energy (5 × 1021 cycles per second) electromagnetic wave (created by bremsstrahlung radiation) passing by an almost unstable (radioactive) nucleus. Bremsstrahlung radiation is released one photon at a time. The first photons emitted are the most energetic and radiate at the highest frequency. Subsequent photons have lower energies and frequencies—from gamma rays and x-rays down to radio waves. The closer these frequencies are to any resonant frequency of nearby radioactive nuclei, the larger the vibrational amplitudes produced in those nuclei. If the trillions upon trillions of electrons in each surge add enough energy to these almost unstable nuclei, radioactive decay accelerates.102 One demonstration of this is shown in Figure 208 on page 397. Large stable nuclei were also made radioactive by powerful bremsstrahlung radiation. The vibrations that are set up temporarily distort a nucleus and, as explained on page 399, can cause it to eject one or more neutrons.83 The nucleus then becomes proton heavy which makes it less stable and more likely to decay. Other nuclei that absorb these ejected neutrons also become less stable. As the Proton 21 Laboratory has demonstrated, in what is call “cold repacking,” most of the heat produced was absorbed in producing heavy elements, such as uranium. [See page 391.] Therefore, accelerated decay did not overheat the Earth or evaporate all our oceans. A miracle is not needed and, of course, should never be claimed just to solve a scientific problem. Anyone who wishes to dispute the Proton 21 Laboratory’s evidence should first read Controlled Nucleosynthesis31 and then explain the thousands of ruptured electrodes, one of which is shown in Figure 206 on page 391. Better yet, borrow one of that laboratory’s thousands of accumulating screens and, using a mass spectrometer, examine its captured decay fragments and new chemical elements, some of which may still be superheavy. Rock is strong in compression, but weak in tension. Therefore, one might think that fluttering hydroplates should have quickly failed in tension—along the red line in Figure 210. That is only partially correct. One must also recognize that compressive stresses increase with depth, because of the weight of overlying rock. The stress at each point within a hydroplate, then, was the compressive stress due to depth plus the cyclic stress due to flutter. Yes, tension fractures occurred at the top of each hydroplate, and the sounds and shocks must have been terrifying. However, those cracks met greater and greater compressive resistance as they tried to grow downward. Remember, tension cracks generally cannot grow through compressed material. Cracks at the top of arched hydroplates became lines of bending weakness, so flexing along those lines was great. These cracks in a geographical region tended to be parallel. 1. Compression. But compressive failure (crushing or impacts) would not produce long, thin cracks. 2. Shearing. But shearing would produce displacements. 3. Horizontal Tension. But horizontal tension would pull a slab of rock apart at the instant of failure. 4. Tension in Bending. Bingo! Lineaments seem to be tension cracks formed by the fluttering of the crust during the early weeks of the flood. Later, other stresses probably produced slippage (faults and earthquakes) along some former lineaments. 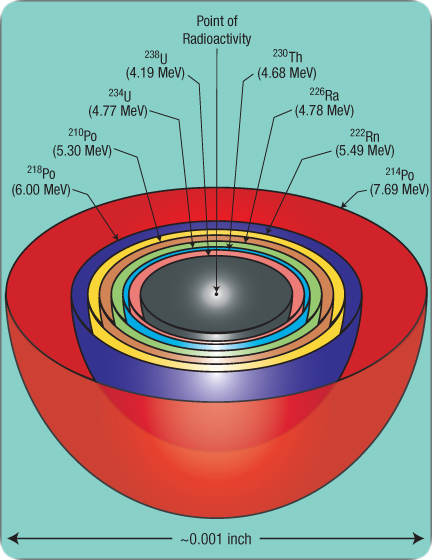 At electrical breakdown, the energies in the surging electrons were thousands of times greater than 10–19 MeV, so during the flood, bremsstrahlung radiation released a sea of neutrons throughout the crust.83 Subterranean water absorbed many of these neutrons, converting normal hydrogen (1H) into heavy hydrogen (2H, called deuterium) and normal oxygen (16O) into 18O. Abundant surface water (a huge absorber) protected life. a.	Electron Capture. Electrons that enter nuclei convert some protons to neutrons—a common event called electron capture. Also, the dense sea of electrons reduces the mutual repulsion (Coulomb force) between the positively charged nuclei, sometimes bringing them close enough for the strong force to pull them together. Fusion results. Even superheavy nuclei form. b. Shock Collapse.86 Electrical discharges through the crust vaporize rock along very thin, branching paths “drilled” by gigavolts of electricity through extremely compressed rock. Rock along those paths instantly becomes a high-pressure plasma inside thin rock channels. The shock wave generated by the electrical heating suddenly expands the plasma and the surrounding channel walls, just as a bolt of lightning expands the surrounding air and produces a clap of thunder. As that rock rebounds inward—like a giant, compressed spring that is suddenly released—the rock collapses with enough shock energy to drive (or fuse) nuclei together at various places along the plasma paths. This happens frequently deep in the crust where the rock is already highly compressed. Superheavy elements quickly form and then fission and decay into such elements as uranium and lead. The heat released propels the plasma and new isotopes along the channels. As the channels contract, flow velocities increase. The charged particles and new elements are transported to sites where minerals are grown, one atom at a time. c.	Z-Pinch. As explained on page 386 and in "Self-Focusing Z-Pinch" on page 407, the path of each electrical charge in a plasma is like a “wire.” All “wires” in a channel are pinched together, but at each instant, pinching forces act only at the points occupied by moving charges, and each force is the sum of the electromagnetic forces produced by all nearby moving charges. Therefore, the closer the “wires,” the greater the self-focusing, pinching force, so the “wires” become even closer, until the strong force merges (fuses) nuclei. Of these three possible mechanisms, c has the most experimental support, primarily with the 21 billion dollar TOKAMAK (a Russian acronym) being jointly developed by the United States, France, Korea, Russia, the European Union, Japan, India, and China. Items a and b should accompany item c.
The shock collapse mechanism is similar to a technique, called magnetized target fusion (MTF), planned for a fusion reactor. In one version of an MTF reactor—a machine that some believe “might save the world”126—a plasma of heavy hydrogen will be injected into the center of a 10-foot-diameter metal sphere containing spinning liquid metal. Two hundred pistons, each weighing more than a ton, will surround the sphere. The pistons will simultaneously send converging shock waves into the center of the sphere at 100 meters per second. There, the plasma will be compressed to the point where heavy hydrogen fuses into helium and releases an immense amount of heat. This cycle will be repeated every second. Unfortunately, an MTF reactor must expend energy operating 200 pistons which, with all their moving parts (each subject to failure), must fire almost simultaneously—within a millionth of a second. However, during the flood, the electrical, lightninglike surges produced thin channels of hot, high-pressure plasma that expanded the surrounding rock. Then, that rock rebounded back onto plasma-filled channels, producing shock collapse—and fusion. With shock collapse, the channel walls collapsed onto the plasma from all directions—at trillions of points. With MTF, hundreds of moving parts must act nearly simultaneously for the collapse to occur at one point. For centuries before the flood, SCW dissolved the more soluble minerals in the chamber’s ceiling and floor. The resulting spongelike openings were then filled with SCW.During the flood, that pore water provided an enormous surface area for slowing and capturing neutrons and other subatomic particles. Great heat resulted, some becoming Earth’s geothermal heat. Simultaneously, electrical discharges “drilled” thin plasma channels within the crust, producing other nuclear reactions and additional heat. Heat added to SCW raises temperatures only slightly, for three reasons. 1. Liquid quickly evaporates from the surface of the myriad of microscopic droplets floating in the supercritical vapor. We see surface evaporation on a large scale when heat is added to a pan of water simmering on the stove at 212°F (100°C). The water’s temperature does not rise, but great volumes of vapor are produced. 2. As more heat was added to the escaping SCW, the fountains accelerated even more. With that greater acceleration came greater expansion and cooling. Nuclear energy primarily became electrical energy and then kinetic energy. Had the nuclear energy produced heat only, much of the Earth would have melted.89 Also remember, quartz piezoelectricity shuts off at about 1,063°F (573°C). A fluid flowing in a uniform channel expands if the fluid particles accelerate as they pass some point in the flow. For example, as a water droplet begins its fall over the edge of a waterfall, it will move farther and farther from a second droplet right behind it This is because the first droplet had a head start in its acceleration. Refrigerators and air conditioners work on this principle. A gas is compressed and therefore heated. The heat is then transferred to a colder body. Finally, the fluid vents (accelerates and expands) through a nozzle as a fountain, becomes cold, and cools your refrigerator or home. The fountains of the great deep, instead of expanding from a few hundred pounds per square inch (psi) into a small, closed container (as happens in your refrigerator or air conditioner), expanded explosively from 300,000 psi into the cold vacuum of space! The fountain’s thermal energy became kinetic energy, reached extremely high velocities and became exceedingly cold. If you have read pages 407–410 and understand the enormous power of the fountains of the great deep, can you spot the error in the following paragraph? Page 407 states that the fountains of the great deep contained 1,800 trillion hydrogen bombs worth of kinetic energy—or more than 7.72 × 1037 ergs. Let’s be generous and assume that only 0.00001 percent of that energy was transferred to Earth’s atmosphere. Simple calculations show that adding that much energy to Earth’s atmosphere would destroy all life. Answer: Understanding Inertia. We have all seen a performer jerk a table cloth out from under plates and goblets resting on a beautifully set table. The plates and goblets barely moved, because they have inertia. What would happen if the performer yanked the table cloth out even faster? The plates would move even less. What would happen if the cloth had been jerked a trillion times faster? No plate movements would be detected. The horizontal acceleration of the table cloth is analogous to the upward acceleration of the fountains of the great deep. Because the atmosphere has mass, and therefore inertia, the faster the fountains jetted, the less the bulk of the atmosphere would have been disturbed. Supercritical water in the subterranean chamber (at the base of the fountains) was extremely hot. However, that water expanded and cooled as it accelerated upward—becoming extremely cold, almost absolute zero. [See "Rocket Science" on pages 598–599.] As the fountains passed up through the lower atmosphere (60 miles above the subterranean chamber), the water’s temperature would have been somewhere between those two extremes. We know that the ice that fell on and buried the frozen mammoths was about -150°F., so the fountain’s temperature was warmer as it passed through the lower atmosphere. Heat transfer through gases is quite slow, so probably little heat was transferred from the somewhat warmer atmosphere to the colder, rapidly moving fountains. Chemical Evolution Theory. The current evolutionary theory for the formation of chemical elements and radioisotopes evolved from earlier theories. Each began by assuming a big bang and considering what it might produce. Years later, fatal flaws were found. In 1948, the follow-on theory assumed that a big bang produced only neutrons.107 A free neutron decays in about 10 minutes, becoming a proton, an electron, and a particle (an antineutrino) that can be disregarded in this discussion. Supposedly, protons and neutrons slowly merged to become heavier and heavier elements. Later, that theory was abandoned when it was realized that any nucleus with a total of five or eight nucleons (protons or neutrons) will decay and lose one or more nucleons in about a second or less.108 Simply stated, growing a nucleus by adding one nucleon at a time encounters barriers at 5 and 8 atomic mass units. The next theory said that a big bang produced only hydrogen. Much later, stars evolved. They fused this hydrogen into helium, which usually has four nucleons (two protons and two neutrons). If three helium nuclei quickly merged, producing a nucleus weighing 12 AMU, these barriers at 5 and 8 AMU could be jumped. This theory was abandoned when calculations showed that the entire process, especially the production of enough helium inside stars, would take too long. The current evolutionary theory for Earth’s radioactivity, first proposed in 1952, has the big bang producing only hydrogen, helium, and a trace of lithium. Inside stars, two helium nuclei sometimes merge briefly (for about 7 × 10-17 of a second—less than a billionth of a ten-millionth of a second). If (and what a big “if” that is! ), during this brief instant, a third alpha particle merges with the first two, carbon will be formed. But how that triple-alpha process could happen is a mystery. This mechanism has not been verified experimentally or computationally.111 Why then, with no scientific support, is this mechanism taught as if it were a fact? Chemical elements had to form somehow. If they did not “evolve,” how did chemical elements get here? This mechanism, as with all prior guesses that were taught widely and are now rejected, is born out of desperation, because creation, the alternative to chemicals evolving, is unacceptable to many. Even if this problem did not exist, only chemical elements lighter than 60 AMU could be formed—by adding more protons, neutrons, and alpha particles (but only if stars had somehow formed). Pages 29–37 explain why stars, galaxies, and planets would not form from the debris of a big bang. Temperatures hundreds of times greater than those occurring inside stars are needed.116 Exploding stars, called supernovas, release extreme amounts of energy. Therefore, the latest chemical evolution theory assumes that all the heavier chemical elements are produced by supernovas—and then expelled into the vacuum of space. By this thinking, radioactive atoms have been present throughout the Earth since it, the Sun, and the rest of the solar system evolved from scattered supernova debris. In the centuries before the flood, the supercritical water (SCW) in the subterranean chamber dissolved certain minerals in the granite crust, such as quartz. Quartz occupies 27% of granite by volume, so the lower several miles of the crust became quite porous.95 Because that dissolving occurred from the subterranean chamber up into the chamber’s ceiling, continuous channels, all filled with SCW, occupied every sponge-like pore space in the lower crust down to the subterranean chamber. When the flood began, the fluttering crust produced piezoelectric surges that generated nuclear energy—an amount equivalent to about 1,800 trillion 1-megaton hydrogen bombs!89 Fortunately, that energy was not released in an explosion at a specific point on Earth. Instead, it was generated gradually and dissipated as heat over many weeks within the 12-billion-cubic-mile granite crust. Water is usually the preferred heat absorber in today’s nuclear reactors, because water readily absorbs the kinetic energy of the multitude of fast neutrons produced in nuclear reactions. Therefore, heating of the SCW in each channel steadily built up astounding pressures in the subterranean water chamber. That pressure accelerated, at hypersonic velocities, all the fountains of the great deep out of the globe-encircling rupture. Were the portions of the 60-mile-thick granite crust far from the pressure-relieving rupture able to contain those internal pressures? As a result of the extreme pulsating pressures in the subterranean chamber, the chamber’s ceiling was blown off in at least two places, forming today’s Gulf of Mexico and Mediterranean Sea. The subterranean water that escaped up through those large openings left by the bursting crust swept wet salt lying along the subterranean chamber floor toward the base of those holes, onto what are now the floors of the Gulf of Mexico and Mediterranean Sea. Over time, thousands of feet of dense sediments were then deposited on top of the less-dense, mushy mother salt layers—an unstable condition.96 Those sediments came from the debris blasted from the holes themselves, sediments from the flood, and centuries of river sediments flowing into the Gulf and Mediterranean. Mother salt layers flow easily, so slight disturbances cause the less dense salt to flow up through the denser sediments. This produces salt domes, as explained on page 119 and in Figure 62 on page 129. Those rising domes were fed by salt from the mother salt layer that flowed laterally into the domes’ bases from adjacent areas. That removal of salt left the depressions (pockmarks) seen in Figure 213. The Salt-Oil Connection. Geophysicists exploring for oil know that large oil fields are often found near massive salt deposits. The hydroplate theory explains this. But first, consider two recent examples of the many unbelievably large salt deposits next to vast oil fields. Beneath the floor of the Gulf of Mexico are huge oil reserves. Most people will recall the 2010 Deepwater Horizon oil spill in the Gulf of Mexico. It was the largest marine oil spill in recorded history. Drilling has confirmed the immense salt deposits that are also under that floor. In 2006, Brazil discovered, off its Atlantic coast, the largest oil field found in the western hemisphere in the last 30 years—the Tupi oil field. It lies first under 7,060 feet of water, then under 10,000 feet of sand and rocks, and finally under 6,600 feet of salt—a total of 4.8 miles below the surface of the Atlantic Ocean. How did all that oil get under such a deep, thick salt layer? Hydroplate Explanation. During the early stages of the flood, some sediments loaded with organic material (especially forests ripped up by the flood waters) were swept off the edge of the hydroplates and onto the exposed chamber floor. It, like the chamber’s ceiling, had also been made porous by and filled with SCW. Evidence of this is seen in Figure 57 on page 128. As the hydroplates settled onto the chamber floor, the scouring ability of the escaping subterranean water increased greatly,98 so large amounts of the precipitated salt were swept out of the chamber and on top of the organic material deposited weeks earlier. Since then, SCW escaping up from the former chamber floor, has dissolved the organic material, forming various hydrocarbons. We see SCW doing this today on the sea floor.99 Because oil is too viscous to penetrate layers of wet salt, the oil deposits have been trapped for thousands of years. Figure 213: Gulf of Mexico. 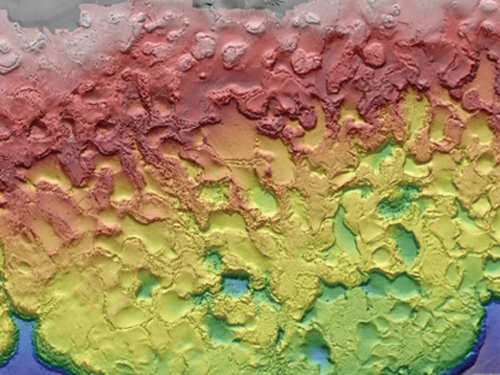 The 135-mile-wide square in the top map is expanded in the bottom map to show a detailed three-dimensional view of the pockmarked floor in the Gulf of Mexico. Each pixel covers an area on the sea floor the size of a typical home. Because the mushy mother salt layer is so fluid, it eventually pooled at the lowest possible depths. Early during the flood, the pulsating, high-pressure subterranean water broke through the granite crust. Sediments almost 30,000 feet thick were then deposited on top of the 1,000-foot-thick mother salt layer. Weight imbalances forced the more buoyant salt to rise through the denser (still mushy) sediments as salt domes—mountains of salt, some taller than Mount Everest. Depressions formed in other places as the salt that was directly below the pockmarks flowed laterally and fed into the bases of nearby, rising salt domes. Huge salt deposits also underlie the Mediterranean seafloor. If you look at a globe, doesn’t it appear that a circular region of the Americas’ hydroplate was removed to form the Gulf of Mexico and part of the Europe /Africa/Asia hydroplate was removed to form the Mediterranean Sea? In the 1920s, Edwin Hubble discovered that the universe was expanding. This meant that the farther back we look in time, the smaller—and hotter—the universe was. For some time after the big bang (about 13.8-billion years ago), matter was so hot that atoms and nuclei could not hold together. All this was confirmed in 1965 when Arno Penzias and Robert Wilson discovered the cosmic microwave background radiation—the afterglow of the big bang. Both received a Nobel Prize for their discovery. Because hydrogen is easily the most abundant element in the universe today, it is reasonable to assume that all elements and their isotopes evolved from hydrogen (1H).112 During the first three minutes after the big bang, temperatures were so hot that deuterium (2H) could not have formed, because the average energy per nucleon exceeded the binding energy of deuterium. Impacts instantly fragmented any deuterium that formed, so during this “deuterium bottleneck” nothing heavier was made. However, during the next 17 minutes, the universe expanded and cooled enough for deuterium to begin forming; the available deuterium quickly “burned” to produce helium. That ended 20 minutes after the big bang when the universe had expanded enough to stop helium production. The amount of deuterium we see also points to the big bang as the only possible source, because too much deuterium exists—especially here on Earth and in comets—to have been made in stars or by processes operating today. Figure 214: Z-Pinch Discovered. In 1905, lightning struck and radially collapsed part of a hollow, copper lightning rod (shown in this drawing87). Professors J. 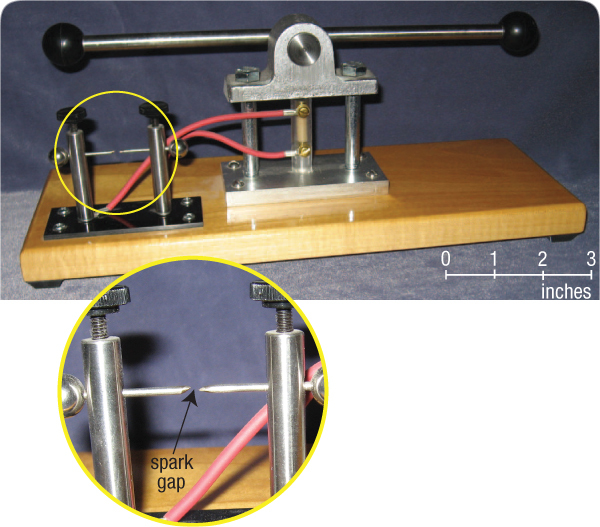 A. Pollock and S. H. E. Barraclough at the University of Sydney then showed that a strong pinching effect occurs when powerful electrical currents travel along close, parallel paths. Later, Willard H. Bennett provided a more rigorous analysis.88 The closer the paths, the stronger the pinch—and when the flows are through a plasma, the stronger the pinch, the closer the paths.The flows self-focus. Patents have since been granted for using the Z-pinch to squeeze atomic nuclei together in fusion reactors. In a plasma flow, trillions upon trillions of electrical charges flow along close, parallel paths—positive charges in one direction and negative charges (electrons) in the opposite direction. The mutual repulsion of like charges doesn’t widen the paths, because the opposite charges—although moving in the opposite direction—are in the same paths. In fact, the magnetic field created by all moving charges continually squeeze (or Z-pinch) all charged particles toward the central axis. During the flood, gigantic piezoelectric voltages produced electrical breakdown in the fluttering granite crust, so each long flow channel self-focused onto its axis. In that flow, nuclei, stripped of some electrons, were drawn closer and closer together by the Z-pinch. (Normally, their Coulomb forces would repel each other, but the electrons flowing in the opposite directions tended to neutralize those repulsive forces.) Nuclei that collided or nearly collided were then pulled together by the extremely powerful strong force. Fusion occurred, and even superheavy elements formed. Thousands of experiments at the Proton-21 Laboratory have demonstrated this phenomenon. Because superheavy elements are so unstable, they quickly fission (split) or decay. Although fusion of nuclei lighter than iron released large amounts of nuclear energy (heat), the fusion of nuclei heavier than iron absorbed most of that heat and the heat released by fission and decay. This also produced heavy elements that were not on Earth before the flood (elements heavier than lead, such as bismuth, polonium, radon, radium, thorium, uranium, etc.) The greater the heat, the more heavy elements formed and absorbed that heat. This production was accompanied by a heavy flux of neutrons, so nuclei absorbed enough neutrons to make them nearly stable. This is why the ratios of the various isotopes of a particular element are generally fixed. These fixed ratios are seen throughout the Earth, because the flood and flux of neutrons was global. Part of the nuclear energy absorbed by the subterranean water can be calculated. It was truly gigantic, amounting to a directed energy release of 1,800 trillion 1-megaton hydrogen bombs !89 Fortunately, that energy was produced over weeks, throughout the entire preflood Earth’s 60-mile-thick (12-billion-cubic-mile) crust. The steady disposal of that energy was equally impressive and gives us a vivid picture of the power of the fountains of the great deep and the forces that launched meteoroids and the material that later merged in outer space to became comets, asteroids, and TNOs. Although our minds can barely grasp these magnitudes, we all know about the sudden power of hydrogen bombs. However, if that energy is generated over weeks, few know how it can be removed in weeks. That will now be explained. Once the bubble is ripped away from the solid, liquid rushes in and tries to fill the pit from which the bubble grew a millisecond earlier. Almost never can the pit be completely filled, so another microscopic vapor pocket, called a nucleation site, is born, ready to grow another bubble. Jetting. As bubbles quickly grow from the hot solid’s surface into the relatively cool liquid, a second effect—jetting (or thermocapillarity)—acts to remove even more heat from the solid. The thin film of liquid surrounding the growing bubble can be thought of as the skin of a balloon. The liquid’s surface tension acts as the stretched rubber of a balloon and is much stronger in the colder portion of the bubble than the hotter portion next to the hot solid. Therefore, the bubble’s skin circulates, dragging hot liquid next to the hot solid up to and beyond the cold top of the bubble, far from the hot solid. With proper lighting, the hot liquid next to the solid can be seen jetting into the relatively cool flowing liquid. [See Figure 215.] Vast amounts of heat are removed as hundreds of bubbles shoot out per second from each of hundreds of nucleation sites per square inch. Figure 215: Thermocapillarity. Boiling removes heat from a hot solid by several powerful mechanisms. In one process, the surface tension surrounding a growing bubble propels the hot liquid away from the hot solid, so cooler liquid can circulate in and cool the solid. 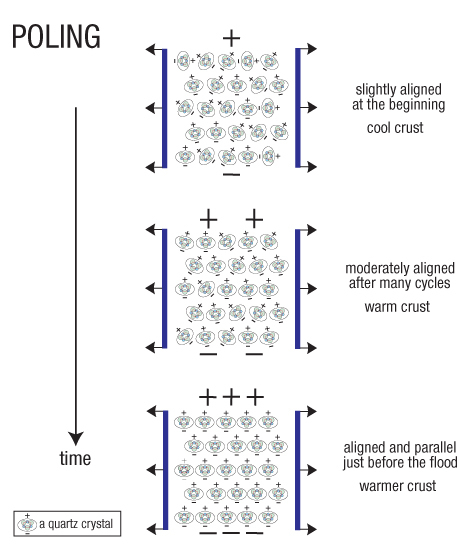 If cooler liquid is also flowing parallel to and beyond the hot, thermal boundary layer next to the solid, as it would have been with water flowing in vertical channels throughout the crust during and shortly after the flood, the tops of the growing bubbles would have been even cooler. Therefore, the surface tension at the tops of the bubbles would have been stronger yet, so heat removal by jetting would have been even more powerful. Burnout. A dangerous situation, called burnout, arises if the bubble density becomes so great that vapor (an effective insulator) momentarily blankets the hot solid, preventing most of the generated heat from escaping into the cooler liquid. The solid’s temperature suddenly rises, melting the solid. With my high-pressure test apparatus at MIT, a small explosion would occur with hot liquid squirting out violently. Fortunately, I was behind a protective wall. Although it took days of work to clean up the mess and rebuild my test equipment, that was progress, because I then knew one more of the many temperature-pressure combinations that would cause burnout at a particular flow velocity for any liquid and solid. During the flood, subsurface water removed even more heat, because the fluid was supercritical water (SCW). [See “SCW” on page 124.] Vapor blankets could not develop at the high supercritical pressures under the Earth’s surface, because SCW is always a mixture of microscopic liquid droplets floating in a very dense vapor. The liquid droplets, rapidly bouncing off the solid, remove heat without raising the temperature too much. The heat energy gained by SCW simply increases the pressure, velocity, and number of droplets, all of which then increase the heat removal.91 Significantly, the hotter SCW becomes, the more the water molecules break into ions (H+ and OH-) so most of the energy becomes electrical, not thermal. When the flood began, and for weeks afterward, almost all that energy became kinetic, as explained in Figure 216. 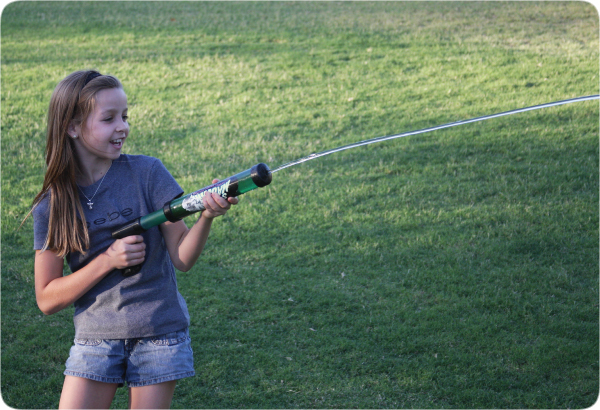 Figure 216: Water Gun. My granddaughter, Laney, demonstrates, admittedly in a simplified form, how great amounts of nuclear energy steadily accelerated the fountains of the great deep during the early weeks of the flood. Laney adds energy by pushing on the plunger. The pressure does not build up excessively and rupture the tube; instead, the pressure continuously accelerates a jet of water—a fountain. Sometimes the jet hits her poor grandfather. For weeks after the flood began, each incremental release of nuclear energy in the fluttering crust increased the SCW’s pressure within the interconnected pore spaces in the lower crust. But that pressure increase was transferred through those spongelike channels in the lower crust down into the subterranean water chamber, so the increased pressure continuously accelerated the water flowing out from under each hydroplate. Therefore, the velocities of the fountains became gigantic while the pressures in the channels did not grow excessively and destroy even more of the crust.92 The fountains energy was almost entirely kinetic, not heat. That energy expelled water and rocky debris even into outer space. Of course, Laney’s gun is small in diameter, so the walls of the tube and nozzle produce considerable friction per unit of water. However, if the water gun became large enough to hold and expel an “ocean of water,” the friction per unit of water would be negligible. Also, if Laney could push the plunger hard enough to accelerate that much water, not for inches and 1 second, but for 60 miles and for weeks, and if the pressure she applied to the plunger slightly increased the gigantic preflood pressure in the subterranean chamber, she too could expel water and large rocks into outer space. Yes, Laney’s gun is orders of magnitude smaller than the fountains of the great deep, but the mechanism, forces, and energy are analogous. Figure 217: Paris Gun. German engineers in World War I recognized that longer gun tubes would, with enough propellant (energy), accelerate artillery rounds for a longer duration, fire them faster and farther, and even strike Paris from Germany. 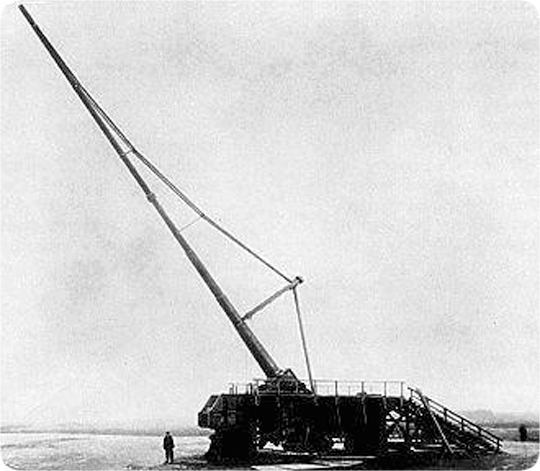 In 1918, this 92-foot-long gun, launching 210-pound rounds at a mile per second, could strike a target 81 miles away in 3 minutes. Parisians thought they were being bombed by quiet, high altitude zeppelins (dirigibles). If a 92-foot-long gun could launch material at a mile per second, how fast might a 60-mile-long gun tube launch material? How much kinetic energy might the subterranean water gain by using nuclear energy to steadily accelerate the water horizontally under a hydroplate for hundreds (or thousands) of miles before reaching the base of the rupture? There, the water would collide with the oncoming flow, mightily compress, and then elastically rebound upward—the only direction of escape—accelerating straight up at astounding speeds. In principle, if a gun tube (or flow channel) is long enough and enough energy is available, a projectile could escape Earth’s gravity and enter cometlike orbits. Nuclear reactions provided more than enough energy to launch water and rocks into space.